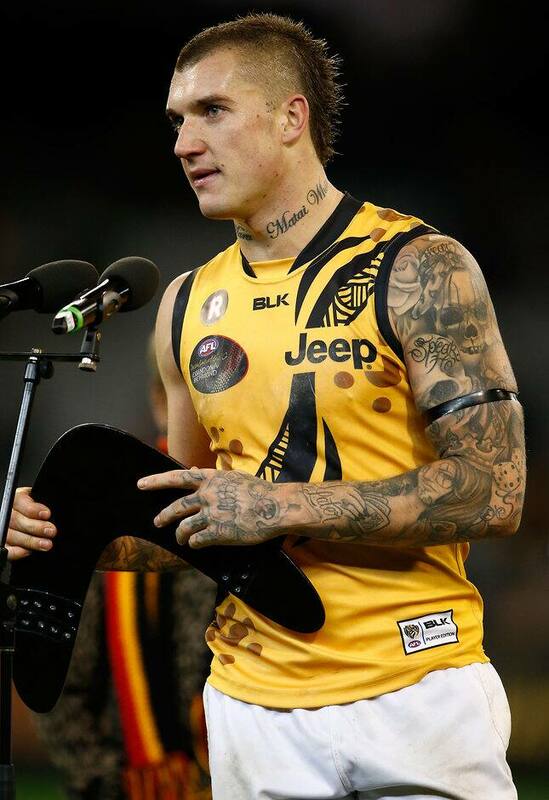 RICHMOND star Dustin Martin is in career-best form according to his coach, but he looms as a scary prospect with Damien Hardwick tipping the midfielder to reach even bigger heights. The 24-year-old was dominant in the 38-point win over the Bombers, amassing a career-high 38 possessions (15 contested), as well as seven clearances, six inside 50s and four score assists. His previous best figure was 36 possessions, which he achieved twice in season 2014 (rounds 10 and 14). Despite 21 disposals at half-time, Martin failed to impress his coach who described his game as "a bit scratchy" in the early parts of the contest. It was Martin's elite kicking that stood out against the Bombers. His ability to see his way through traffic and hit a target by foot was incredible, as was his work at the stoppages. After 10 rounds, the classy midfielder is averaging a career-high 27.5 disposals per game, and is also the No.1 ranked Tiger for pressure acts with his work rate off the ball outstanding. So it's no surprise Hardwick believes Martin is playing the best football of his career. "He's an incredible athlete…you can't put a value on players like him," Hardwick said after the game. "The scary thing is he's still got some areas of his game that we'd like him to improve as well. It's credit to the lad, every year he just seems to get better and better. "He's 24, so it's a great sign. He works really hard on his game and is always looking for ways to improve. We've probably been crying out for that inside mid player and he's certainly put his hand up for that, which is great, so credit to him." Martin will be one player North Melbourne will watch closely this week in the lead up to Friday night's clash in Hobart. After a slow start to the season, the Tigers are starting to build momentum with three wins in a row. But they face a huge test on Friday night, against a rebounding Kangaroos side. "North are an outstanding side, and played a pretty competitive game against Sydney on their home deck, which is tough," Hardwick said. "They'll be disappointed but they are a fantastic side and are playing as good a footy as anyone in the competition. It's going to be a big challenge for us but we're looking forward to it. "We've had three wins on the trot, but we're excited to go up against the team that's sitting on top of the ladder."